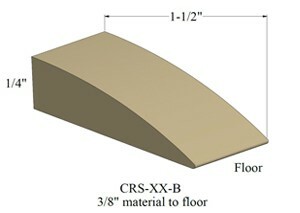 This 1 1/2" wide transition strip is for a 3/8" floor to flush floor. 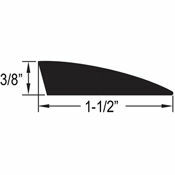 Johnsonite floor reducers are an ideal product to protect floor edging quickly and easily. It protects the floor's edging while providing a gentle grade between flooring surfaces to promote safety in high traffic areas or between rooms. This vinyl transition strip is available in Johnsonite's Standard 27 Colors. Sold in 12 foot transition strip sections. See the Transition Installation Video for help during the process of installing your transition strip. Please Note: Every monitor displays colors differently. The colors seen on this website may not accurately depict the colors of the products. Request Color & Transition Samples here.